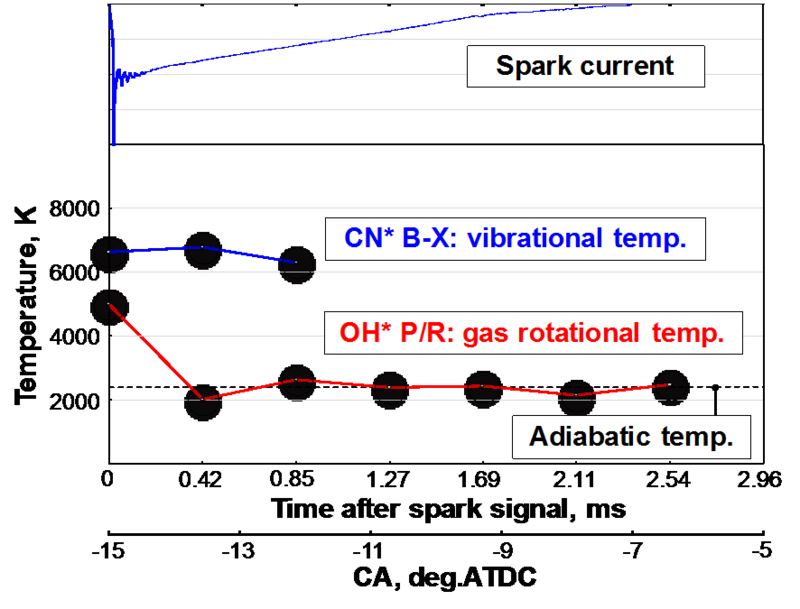 The spark discharge ignition process was investigated using simultaneous temperature measurements of the spark discharges and the initial flame kernel. 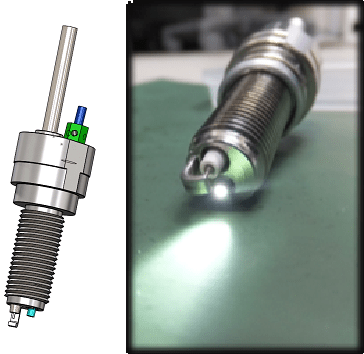 We were able for the first time to measure a time series of emission spectra from the spark discharge and initial flame kernel inside a spark-ignition engine using a spectrometer coupled with a spark plug and optical fiber. We discuss thermal energy transfer from the spark discharge to the combustible mixture. The main conclusions that can be drawn from this study are as follows. CN* emission can be detected from the spark discharge, visualized using a high-speed camera during the arc discharge phase. Our results confirmed that the plasma temperature of the spark discharge was nearly 6800 K and that thermal energy was transferred from the spark plasma channel to the combustible mixture. The gas temperature of the initial flame kernel approached that of the adiabatic flame temperature. Fig. 2. Structure of a developed spark plug with optical fiber. Fig. 9. Time series of plasma vibrational temperature and gas rotational temperature. N. Kawahara, S. Hashimoto, E. Tomita, Spark discharge ignition process in a spark-ignition engine using a time series of spectra measurements, Proceedings of the Combustion Institute, (2016) in press.